Kate Jasper, Marin County, California’s own organically grown amateur sleuth, returns in this eleventh mystery in the series. 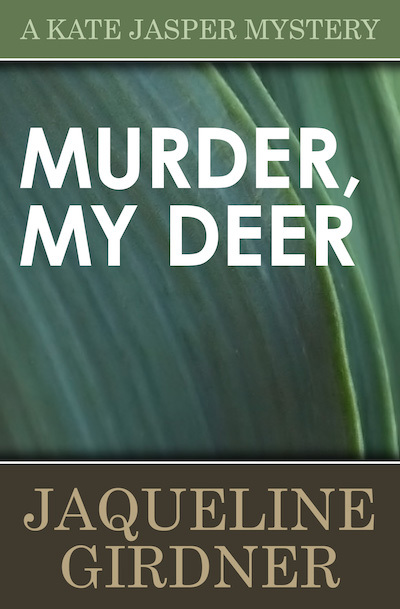 In Murder, My Deer, Kate and her sweetie’s budding romance has finally flowered into a full-fledged marriage. But no one ever promised them a rose garden. Deer have gate-crashed their yard to munch every bud, blossom, and petal. Instead of happily honeymooning, Kate and her sweetie attend the deer-abused support group for those whose dearly beloved plants have been deerly beheaded. Antlers clash during group discussion, since everyone has their own idea for deer prevention . . . from feeding them to killing them. Dr. Searle Sandstrom, ex-military, would like to use a gun, napalm, and land mines. But someone bashes in his head first, and no one spots any hoofprints near his dead body. Killing season is open, and Kate is game to flush out the hunter before she becomes the hunted game.